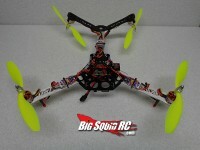 Arrmattan « Big Squid RC – RC Car and Truck News, Reviews, Videos, and More! You are browsing the "Arrmattan" tag archive. Armattan Quads V-Tail Review (355mm)3DBill here, V-tail quads are a bit more exotic than the average quad. They have four motors like a traditional quad but the tail motors are tilted to provide thrust to turn so it has tail control like a tricopter. Lets check out this back yard beast. Hit the “Read More” to continue onto our thoughts..